We Won A UK Lingerie Award! To our long-standing fans as well as new customers, it may come as no surprise that Playful Promises has a long history dedicated to excellent customer service, proliferation of innovative, flirty and quirky designs, and commitment to inclusivity in all of its aspects. So it was with great honour and delight that we felt our work had been recognized when we took away the Small Business of the Year Award at the prestigious UK Lingerie Awards! It is one of the biggest events in the intimate apparel calendar with nominees being voted for by industry representatives, celebrating industry excellence. Going from strength to strength in the last few years, we have been applauded for our inclusive size range, having expanded it over four times since 2015. Playful Promises was one of the first brands in the UK to offer open-cup bras in plus sizes, and one of the few independent brands to have continually expanded sizing. Recognizing a demand, we launched a US warehouse and website in late 2016, which has led to growth both via retail and wholesale. To cater to our ever-growing base of customers and fans, as well as selling online we are happy to say that we are also stocked in over 200 stores and boutiques worldwide. We are passionate about diversity, and are extremely proud of our achievements that have set us apart from other brands. It is heartening to see that several of our notable campaigns have been met with a lot of positive responses and covered by a large number of media outlets. In April 2017 we released our Ageless Fashion campaign, working with models in their late 60s to challenge society’s definition of beauty and sexuality. This was picked up by the press (and shortlisted for another UK Lingerie Award for Marketing Campaign), recognizing the need to represent beauty and sensuality in women of all ages, something that has thus far been sorely lacking in the industry. Following the successful launch of our Curve collection in 2016, partnering with Gabi Fresh, a US influencer and plus size swimwear designer felt like a natural progression in 2017. This extended our size range of up to UK size 28 and bra sizes up to 44G and featured outré, trend-led styles. The collaborative plus size lingerie collection has been a sell-out success and was featured in major national and international press such as Glamour and InStyle, creating a huge media buzz. Another campaign of significance was shooting our Bettie Page Lingerie brand on non-binary drag queen Violet Chachki, signifying our commitment to inclusiveness of all genders and sexualities. This was the first time a drag queen has fronted a lingerie campaign, something we consider to be quite a break-through in the industry. While ground-breaking, we were very pleased to find that the overwhelming response to the campaign has been a positive and encouraging one, with media outlets such as Vogue.It, Harpers Bazaar and Huffington post reporting extensively on it. As a brand we are thrilled to be recognized for the work we have done in promoting inclusivity and our commitment to excellence in design. We are therefore pleased to have been shortlisted for the Best Multichannel Retailer Under £25m Turnover Award at the upcoming Drapers Digital Awards 2018 which will be taking place in April. The awards form part of the wider Drapers Digital Festival which brings together more than 700 professionals to celebrate excellence in the ecommerce industry. We hope you are all wishing us luck! Here at Playful Promises we have never been known to shirk away from a challenge, or from controversy. It has always been our aim and brand mission to be as inclusive as possible, pushing and breaking the boundaries of what is considered “safe” and “acceptable” representation in fashion and in lingerie specifically. From working with more people of colour in our campaigns and collaborations (such as teaming up with Gabi Fresh for a collection), to being one of the first independent lingerie brands continuously expanding size ranges, Playful Promises has been unwavering in its dedication to inclusive, intersectional feminism, and being pro-active in the fight against body snark. Photographing Violet Chachki, the winner of RuPaul’s Drag Race Season 7, was a natural progression of our ethos by including a non-binary model and performer as the face of our latest Bettie Page launch. With her stunning femme-fatale looks and sumptuous vintage styling, it could not possibly have been a better choice, and received an overwhelmingly positive response both from our fans and the press. The outpouring of support has felt validating, heart-felt and enormously gratifying. It also illustrates further, if any illustration was needed, how sorely diverse representation is lacking in the fashion industry. With this in mind, we asked few non-binary/trans and gender-queer fans about their take on representation, and the role lingerie plays in it. We spoke to Vikki Le, a fashion and graphic designer based in New York; Australian MUA, artist and activist Ruby Allegra; London-based gallery producer and artist Parma Ham; and US-based full-time drag queen Louisianna Purchase - and asked them to share their views on our Violet Chachki-fronted campaign, the importance of inclusivity, and how their lingerie choices help to inform their gender identity. What does non-binary mean to you? What considerations do you make when choosing lingerie? What do you look for? “Fancy lingerie is what we as people wear to fulfill other people’s fantasies”, muses Vikki, “I wear it to fulfill mine”. The theme of lingerie representing confidence and sexuality is a recurring one, with Louisianna adding that “Lingerie sets the mood for me. 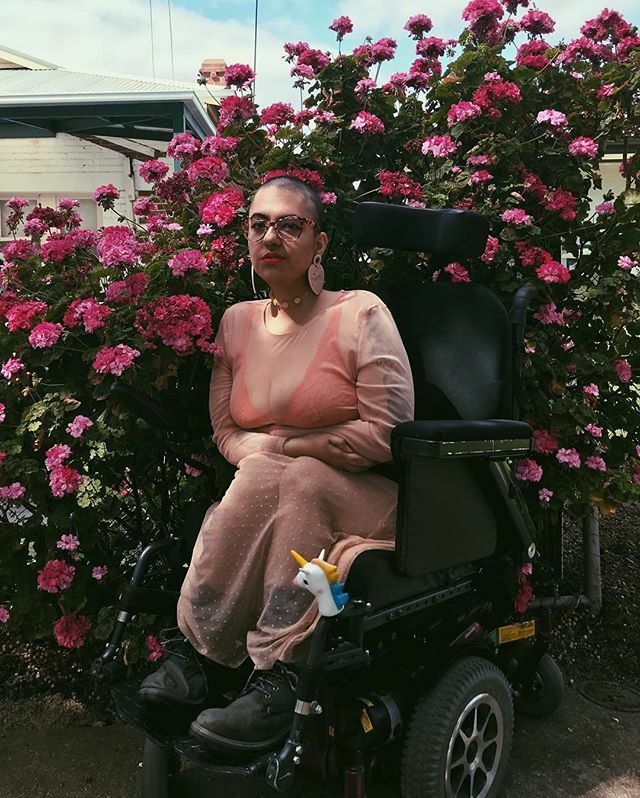 I feel most powerful and seductive in lingerie.” Ruby also highlights the importance of comfort, both physically and mentally – “as a disabled person, lingerie has been a very important part of my work towards radical self acceptance, body positivity and the unlearning of ableist beauty standards”. Both Vikki and Ruby are also quick to highlight the importance of colour in how lingerie makes them feel and in setting the mood. How do you go about styling your look and how do you work lingerie into it? “Lingerie is either the spotlight or a necessary layer that I never skip!” – Louisianna muses enthusiastically, adding that “lingerie is definitely a staple in my wardrobe”. Parma Ham adds – “The way lingerie frames the body is so important. Well chosen lingerie can transform my boyish body into something highly feminine”. How important is it to have queer, trans and non-binary visibility in lingerie? Ruby raises an important question – “If non-binary people, for example only see images of cisgender or binary-gendered people celebrating their bodies through wearing and enjoying lingerie, what message does that send about non-binary or genderqueer bodies?”; adding that “we live in a very heteronormative and cisnormative society, which often does not respect or acknowledge queer, trans and non-binary identities as being real, valid or worthy.” Vikki adds another important point, pointing out that “we are more than just victims or sexual fantasies”. Louisianna adds that the importance of representation is a useful tool in breaking down stereotypes and current societal boundaries. Parma Ham elaborates, commenting on the current state of global affairs, adding that “Right now everyone under the trans and queer umbrella needs as much visibility and as many positive narratives as possible. Seeing queer people in lingerie is a gentle reminder that we too are human, we too are beautiful and desirable”. What would you like to see more of from lingerie/clothing companies? How can they be more inclusive? How is lingerie important to your identity? “Lingerie sets the mood for me. I feel most powerful and seductive in lingerie”, muses Louisianna; the theme of lingerie representing confidence and sexuality is a recurring one, with Vikki adding that “it’s a whole act of seduction and power”. Furthermore, there is no denying the transformative power of lingerie, with Parma Ham noting that “I value the power of transformation, and the freedom to not commit to either masculinity or femininity, this is where I feel most comfortable.” Vikki goes as far as describing the act of wearing lingerie as an “act of rebellion”, since wearing lingerie was not something they were always able to do throughout their life. Lingerie, it appears unanimously, represents both strength and freedom. How do you foresee the Violet Chachki fronted Bettie Page campaign being received by others? Ruby sees it as a “really great, refreshing step towards visibility and representation for sexually and gender diverse people”, with Parma Ham adding that it’s another kick to the rigidity of the binary – “I think everyone can benefit from society being less strict on what you can and cannot wear.” Louisianna reiterates its importance in breaking boundaries for LGBTQIA folks. It is evident that the power of representation for socially marginalized groups cannot be overstated, nor can the change come too soon, with Ruby concluding that “sexuality is a huge part of many people’s identities, so denying groups of people the access and means to explore that can be very harmful. A lack of representation can lead to isolation and serious issues relating to self-esteem, body image and mental health”. Here at Playful Promises we are hopeful that our contribution to the fight towards greater representation is just one step among countless in the right direction.